Myanmar has recently opened its doors to the world after decades of isolation and now is the time to explore this fascinating country. 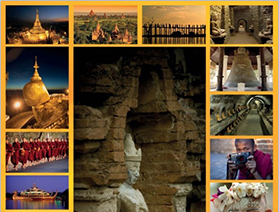 Myanmar Shalom, formed in 2006, is one of the leading boutique travel companies in Myanmar. We work with clients and companies all over the world to create insightful itineraries for travelers, carefully crafted to the needs and interests of each individual and group. Any travel agents can arrange hotels, flights, car rental but a guide can make or break the trip. Our local guides, sightseeing programs are carefully chosen to provide an insightful, authentic and meaningful connection to Myanmar’s people and to directly benefit the local economy. For corporate Travel: We have acted as logistics organizer for US-ASEAN Business Council Mission since 2011 and assisted logistics travel arrangements for companies such as Conocophillips, Deloitte, Google, Honeywell, Oracle, General Electric, Pfizer and others in Myanmar. We are registered travel agent in Myanmar since 2006 and proud members of Myanmar Travel Association (UMTA), American Society of Travel Agents (ASTA) and Pacific Asia Travel Association (PATA). Our main office in Yangon has over 20 employees and has branch station in New York. In order to make easy travel arrangement for our clients and partner agents we have station offices in Bagan, Mandalay and Inle Lake. Graduate of Yeshiva University, Sy Syms School of Business in New York City, Sammy Samuels has promoted his country, Myanmar to all who know him. That’s why some of his friends and colleagues call him the “Ambassador of Burma.” His over 10 years experience in Business and travel industry abroad & love and thorough knowledge of Shalom operation team has made Myanmar Shalom Travels stand out among many travel companies. During his years in America, Sammy has assisted many people in designing and arranging their visits to Myanmar. Through Myanmar Shalom, Sammy is bringing more tourists to his amazing country. Sammy is also the leader of Jewish Community of Myanmar and his unique role in the Jewish community of Myanmar and about Myanmar Shalom Travels has been chronicled in articles in the New York Times, L.A Times, Jerusalem Post, Travel & Leisure and other newspapers. Operation Team At Myanmar Shalom Travel, we know well that our success depends on the quality of our people and the high degree of standards they set for themselves. We are fortunate to have talented and dedicated people working for our company. Myanmar Shalom office team and tour guides range from youths to seniors, all of whom are very knowledgeable, flexible and understanding of the rigorous requirements of today’s travelers. They have extensive experience hosting group and individual tours, sharing their love and knowledge of their native country with visitors from around the world. Myanmar Shalom celebrated its 10-year of Excellence at The Strand Hotel Yangon in 2016 December. We will continue to keep our excellence service and would like to share the beauty of Myanmar with the rest of the world & look forward to welcoming you in Myanmar.